This sale is for 8 plastic quart bottles of Tintable Bed Liner (SMR-1000T) and two quarts of SMR-222 activator; which when mixed yields two gallons sprayable. Also included is a mixing cup for measuring the color and the activator. 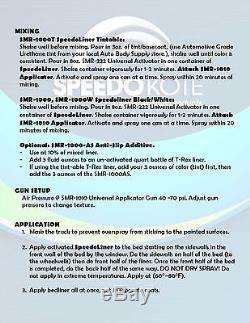 A free shutz spray gun to apply the bed liner is also included. Coverage is 15 Square Feet per Quart of T-Rex Bed-Liner. The SMR-1000T is a 1.7 lbs/gallon voc and is the only bed liner that is 50 state compliant. SMR-1000T is a true 2K urethane with outstanding adhesion to steel and sanded paint. This coating is formulated to withstand the same atmospheric conditions as a high quality single stage urethane topcoat. Excellent Exterior Stability from UV Light. 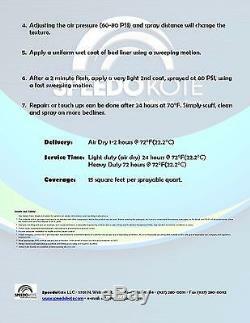 Easy to use: ADD hardener - SHAKE - SPRAY (see instructions below). Protects against rust, corrosion salt, damp & extreme temperatures. Waterproof, flexible, helps deaden sound & vibrations. Apply with shutz gun at different pressures to obtain different textures. Surface should be cleaned of all grease, oil, dirt, rust, etc before sanding. Wash area with soap and warm water, then rinse and dry. Thoroughly clean area with Wax and Grease Remover. Scuff surface with 180-220 grit sandpaper. Re-clean with wax and grease remover, then dry with a clean towel. Instructions: Apply Bed Liner between 60 - 85 degrees F and humidity less than 70%, Not in direct sunlight. Add 3 ounces of color (Tint or Basecoat) to a quart bottle of SMR-1000T, put cap back on and shake 1 minute. 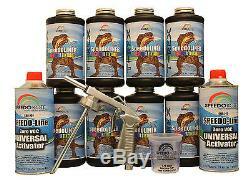 Then add 8 ounces of SMR-222 activator to the quart bottle that contains the SMR-1000T and color. Screw on quart bottle cap and shake for two minutes. Remove the cap and screw in the Shutz Spray Gun. Adjusting the air pressure (60-80 PSI) and spray distance will change the texture. Apply a uniform wet coat of bed liner using a sweeping motion. After a 2 minute flash, apply a very light 2nd coat, sprayed at 80 PSI, using a fast sweeping motion. Specification: Usable Pot life at 70 degrees F / 20 degrees C : 60 minutes Touch Dry at 70 degrees F / 20 degrees C : 1 hour subject to film build. Light duty: 2 days at 70 degrees F / 20 degrees C. Regular duty: 5 days at 70 degrees F / 20 degrees C. The contents of this package may have to be blended with other components before the product can be used. Before opening the packages, be sure you understand the warning messages on the labels and MSDSs of all components, since the mixture will have the hazards of all its parts. Follow spray equipment manufacturers instructions to prevent personal injury or fire. Provide adequate ventilation for health and fire hazard control. Follow company, product MSDS and respirator manufacturers recommendations for selection and proper use of respiratory protection. Be sure employees are adequately trained on the safe use of respirators per company and regulatory requirements. Wear appropriate PPE such as eye and skin protection. In the event of injury, see first aid procedures on MSDS. Always observe all applicable precautions and follow good safety and hygiene practices. 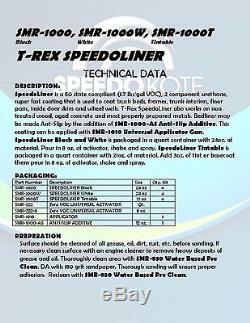 The item "T-Rex Tintable spray-on truck Bed Liner, SMR-1000T-K8 Bedliner kit withFree Gun" is in sale since Monday, June 22, 2015. This item is in the category "eBay Motors\Automotive Tools & Supplies\Auto Paints & Supplies\Specialty Paint & Coatings\Truck Bed Liner Paint". The seller is "speedokote" and is located in Dayton, Ohio. This item can be shipped to United States.